Home MOTHERHOODBABY Baby’s got glasses and what we, as parents, should know about sight! About a few weeks ago, we made a decision to get Lexi glasses. After a yearly trip to an ophthalmologist, we found out that Lexi was nearsighted (she can see well close up but not far away) and could possibly need glasses. The doctor didn’t seem so sure that she HAD to have them, if we didn’t want to get them, but after figuring out how she must be seeing and reading up on some studies, we decided that it was necessary. So that same day, we took her to a local lens store and got her two pairs of glasses. We had an idea that it would happen sooner or later, as Andrew’s side of the family have all been in glasses since a very early age, especially the females. Given that childhood onset myopia (nearsightedness) is primarily genetic, we figured she would need glasses at some point, but, of course, hoped that she wouldn’t, since no one in my side of family was myopic before 17 years of age (which is the age where the line between a genetically inherited childhood onset myopia and adult myopia gets drawn). It turns out, based on the studies I’ve read, that having one parent with childhood onset myopia is just as bad as having two! That part was a surprise and I just discovered it a week or so ago in my continued reading about myopia. You have 43% chance of becoming myopic before age of 17, if one of your parents was myopic (again in childhood only), and you have 45% chance if you have two parents. Not a big difference. (Only 12% chance if no myopic parents, just fyi). That’s given certain lifestyles that I will talk about later. So here we were. Lexi needs glasses to see clearly. So we went to get glasses. It was amazing to see her reaction. Her vision needed enough correction that she saw a big difference. She could now see sharp lights in the distance, not just blurs. The carpet floor that she has been walking on in the store was now a sharp pattern rather than slightly smudged grey (I am assuming, because she kept staring at it). Everything was brand new and shiny! She was seeing the world anew! You cannot imagine the excitement in both of us when it happened. We had no problems with having her keep her glasses on. She took to them instantly. She was always so good keeping her sunglasses on, but this time her glasses helped her see. There was no denying that, so she kept them on. She does take them off to breastfeed, and we take them off to read as well (to reduce accommodation), but otherwise she keeps them on almost all the time. I cannot tell you how glad we were that we were able to catch it this early before it got worse. That she didn’t go for years unnoticed, because regular vision screening checks aren’t a norm for young kids right now. Knowing that made all the difference in the world. (well and the fact that she looks soooooo cute in glasses helped too). I have learned so much information during this discovery that was not widely available to us or most other parents. 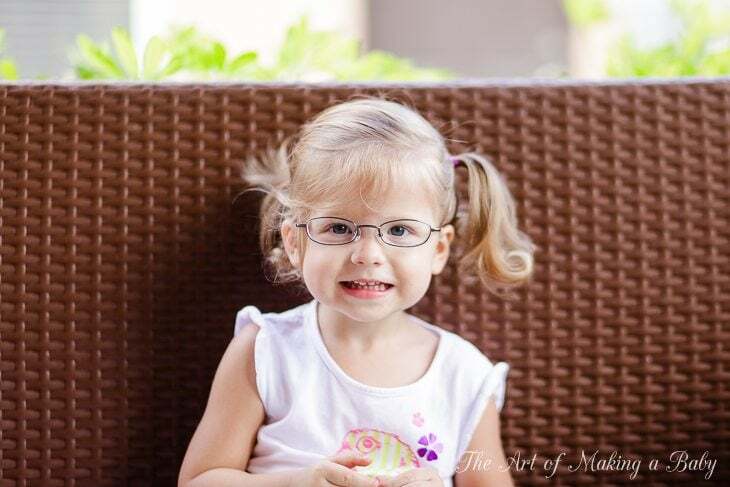 Even some ophthalmologists aren’t caught up on the recent studies which is a shame, because if you were myopic as a kid and you have a child now, there are steps that can be taken to help slow down the development of myopia in your kid. We are in a good routine now with glasses, as well as our plan for the future. I will be getting her a few more frames that are lighter colored and more rounded that they didn’t have at the store once we confirm her prescription and sizing, and we have an appointment with a specialist in Miami for a second opinion. But for now we are in a good place with all of this. I’ve also been asked a ton of questions since Lexi started wearing glasses. Mostly from concerned parents who had to wear glasses as kids and have a higher chance of passing it down to their child. I have read up on a lot of studies, asked a lot of questions myself and I feel like I have a good handle on what is going on and what can or cannot be done. I’ll go over the common questions and then talk a bit about what I found out on my own that is pretty interesting stuff. How did you find out Lexi needed glasses? How can they tell what their vision is at such a young age? Were there any signs you saw? Did you have any issues with getting her to wear glasses? Does she wear them all the time? Do you know the one thing that DOES have an effect on whether your child will become myopic or not? S0 the lesson of the day: get your kids eyes tested and get them outside! At 6 months, at our request, our pediatrician gave us a referral to a pediatric ophthalmologist to check Lexi’s eye that seemed to be turning in. It turned out to be a common lid issue, that simply covered one eye more than the other, creating that illusion, because babies don’t have a distinct bone there. They all grow out of it, once the bone becomes more prominent. But the key was no issues with the eye. Whew! The ophthalmologist asked us to follow up at a year which we did. At that time she showed some nearsightedness which he said will most likely correct itself by 2. So we followed up again at 2 and that’s when we discovered the nearsightedness didn’t go away, but actually progressed. That puts us at a few weeks ago. They use an instrument called auto-refractor. Our appointment consisted of a dilation and a bunch of “look here, look there”. He put lenses in front of her, looked in the eye, made sure the eyes were healthy. And then gave the diagnosis that her eyes were healthy but that she was myopic. He kept downplaying it like it was no biggie. I am sure he sees many actual problems with the eye than isn’t “simple myopia”. But for us having our daughter not be able to see clearly IS a biggie. The answer is pretty much no. The reason why I say “pretty much” is because now looking back at it, I understand better, but we just never attributed it to bad eyesight. Toddlers are funny, you can almost never tell they can’t see clearly (especially with nearsightedness). She didn’t squint when looking in the distance. Her eyes didn’t act funny. She didn’t complain of blur. She didn’t rub her eyes extensively. That’s the worrisome part. Most myopia in children isn’t even detected till they go to school and can’t see the blackboard, but sometimes that is just too late because it was allowed to progress without correction. And the effect of not being able to see for all those years! That’s one of the positives I am taking out of this whole experience! With corrected vision, she can experience everything anew, early on and hopefully keep the progression in check. Looking back at it, it makes sense why she wasn’t interested in the Safari ride at Disney. She seemed to see the animals, but quickly lost interest in each one and wanted to breastfeed due to the bumpy ride. Of course! If it’s just the shape of the animal, I’d be bored too. We simply attributed it to her not being interested. The strange part is that she saw it all: birds, moon, animals, cars- all things far away. Or at least appeared to see. I have learned in my reading that little kids have an amazing ability to adjust their vision in a way that an adult can’t. Sort of how the brain simply fills in the picture for them. So she probably saw much better than we give her credit for but she still wasn’t seeing clearly. Even now in glasses she isn’t too interested in the zoo animal, so I still don’t know if that was a sign of nearsightedness or what. No, not at all! She could see better and that was enough for her to wear them happily. She occasionally takes them off and throws them down when she is frustrated, but she is 2, so that’s too be expected. In general, she is learning to treat her glasses with respect and always either gives them to us or puts them on a shelf. Yes and no! Right now, we take them off for reading and other close up activities to reduce accommodation ( focusing of the eye) and she takes them off during breastfeeding. We’ll be talking to a Miami specialist about progressive glasses that she would wear constantly. Other than that, they are on almost all the time. I have read a lot of studies and excepts. I am still continuing to read, but here is the low down. Some people wrongfully believe that if you don’t wear glasses, then you will allow your eyes to train themselves to see better and that by wearing glasses you’re making them “lazy”. That couldn’t be further from the truth. Aside from faulty logic there based on lack of knowledge about how the eye works, the studies have shown again and again that the WORST progression of myopia happens when the vision isn’t corrected by glasses or contacts. By straining your eyes to try and see, you’re only worsening it. The less accommodation (focusing) your eyes have to make, the less the degree of myopia progression. This was surprising to me. They have a million studies out there showing that reading and other close up work has absolutely NO effect on whether a child will become myopic or not. So is watching TV close up, or playing video games. In fact, you would have to spend 8-9 hours a day reading or doing near activity to cause myopia with it. It’s like the STOP signal to the growth of the eye (which is what makes myopia worse as kids grow). Just 1-2 hours a day is enough to offset the effects 8-9 hours of close work based on some studies. They are not yet sure whether it’s the outdoor light (scientists think that’s the most likely the case), or the focusing in the distance, or UV rays, or peripheral vision, that creates the protective effect, but THE MORE time you spend outdoors, the bigger the protective effect. Study after study showed that correlation! Regardless of amount of time spent on near work/reading/playing/computer work, children who spend 14 or more hours a week outside have a much smaller chance of developing myopia. Aside from genetics, it was the ONLY other variable that made a difference in myopia in most studies. It was especially protective (in my opinion) of those children who only had 1 parent who was myopic as a child. And the more they play outside the better it is, with each weekly hour accounting for a 2% improvement in progression of myopia. That, to me, is amazing news that should be shared with EVERY PARENT! If you can up the odds of your child not developing or slowing down the development of myopia (in high risk situations with myopic parents) by just spending as much time outdoors as possible, then it’s the best “cure” . Remember how I talked about chances of becoming myopic if one or two of your parents were myopic as kids? Well, that changes to much better odds with one parent, if you have 2 hours or more outdoor time daily. Obviously, it’s not fool-proof or works for everyone- everyone’s genetics and reasons for/development of myopia are different, but statistically it’s a significant difference. It’s also surprising how much only two hours a day can be especially when you’re dealing with a toddler. We live in Florida, so a lot of time time is spent outdoors as it is. However, 2 hours can still be a challenge some days, because you have naps, activities, reading, toy play and constant mealtimes, so by the time that’s all done, it’s dark outside. Lexi is a voracious reader, so she would ask us to read book after book after book. We now take that activity outside, just in case it ends up helping 🙂 It’s just about restructuring the time to allow for the maximum outdoor time before the day is over, which in the beginning was an interesting adjustment. But now? It’s actually pretty cool. I am coming up with more outdoor activities, we are building a swing set (that was in progress before I found out about outdoor time), we have amazing Monkey Bars, I am going to plant more flowers and have Lexi help me with them. Lexi asks to go outside all the time now, while before she was often reluctant, unless we were going to a playground. She would have rather sat and read in my lap than gone outside on some days. We’ve always gone to playgrounds and bike riding, ran around the backyard, but now it happens daily. And I have to say that I am loving this new way. I always used to be an outdoorsy person, but my husband hates anything to do with sand or bugs, cold or hot, he just doesn’t like being outside, so I was starting to do the same thing myself, but now I am re-invigorated by the prospect of being outside as much as possible. 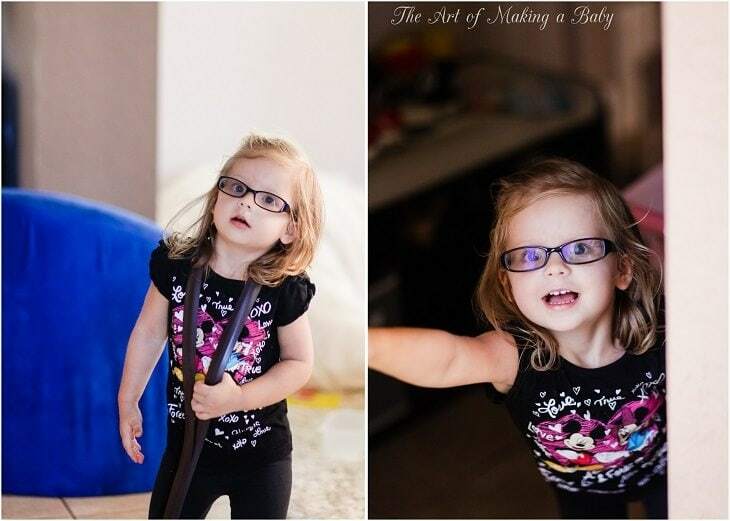 I think this experience and everything I learned from it deserved being passed onto other parents, rather than just a recap of how we got glasses. Edit: If you decide that you want to get your kid checked out, make sure to go to an ophthalmologist, since they also check for eye health and have a comprehensive screening. 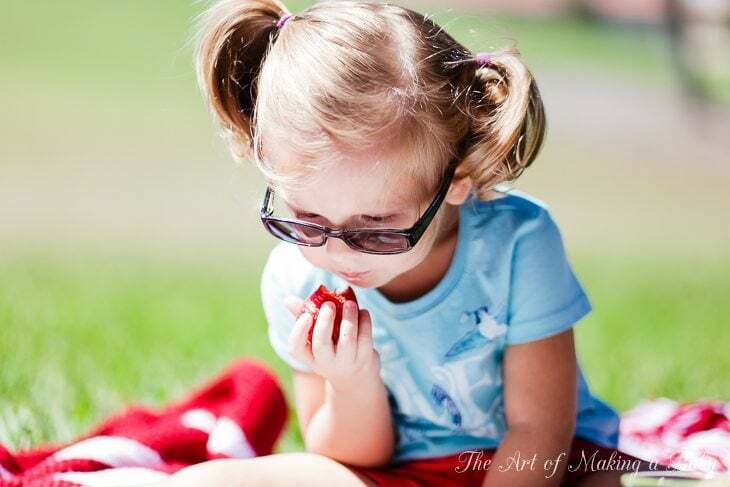 Aside from myopia, there is a host of other things that can make your child’s vision “funky”. Ideally, vision checks should be done yearly, because you can develop myopia or other issues at any time. So it should become a part of yearly screenings, like wellness checks, dermatologists visits and so on. To me for some reason she looks so much like your mum in the last set of photos where she is wearing the tinted glasses. Lexi is looking absolutely precious by the way. Probably cuz the glasses are almost identical to the ones my mom is wearing. I want to get her slightly more rounded black frames once we get a second opinion on her script and everything. Very interesting!! Thank you for sharing your information!! 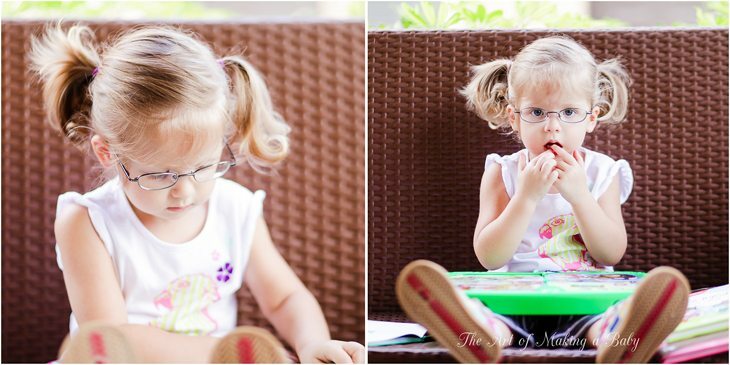 She looks absolutely adorable with her glasses on and I love her sunnies–very chic and hip. My oldest dd had amblyopia and strabismus diagnosed at age 3. The eye drift was so subtle that we never noticed it but when we took her to a pediatric ophthalmologist, we discovered that her vision in her left eye was terrible. He showed us how bad her vision was in her left eye while the right was almost normal and told us that left untreated, she could have gone blind in her left eye. I cried the whole way home from that appointment and went straight to order her glasses but I couldn’t believe how bad her vision was. She had to patch her ‘good’ eye for about a year to help her brain start using that eye more and she hated that, but luckily we could order some really cute eye patches that went over her glasses. We also used transition lenses for her because protecting her eyes while outside was very important as well. She is now wearing a contact in her left eye only and uses glasses when she doesn’t want to wear her contact but I’m so very glad that our pediatrician caught it when she did! That’s amazing! I’ve heard many stories like this which is why I am just so surprised that vision screenings aren’t widely done during the first 2 years of kids’ lives. I’m so glad you wrote about this! It’s not something I hear about often but it totally applies to me if/when we have kids. I had glasses at age 7 because they finally figured out I couldn’t read the blackboard. Now my vision is awful. My husband also has child onset myopia and both our families wear glasses as well. Thanks again! It’s amazing how little information is available to general population and only having to deal with it now I am finding out that there is a lot more out there that could help people. We had no clue about all this before. This doesn’t have to do with your case, but I think it is good knowledge to have: When I was younger the optometrist noticed that I was beginning to get a lazy eye. He said usually we would have to patch it for a while and then get corrective lenses, but my parents found out about “visual therapy.” We saw a visual therapist who I met with once and a while, and every day I had to do excersizes at home to strengthen my eye. It was very difficult as I was pretty young and was frustrated by it, but I am so thankful for it now! In junior high I ended up getting a light prescription for being near sighted, but I do not need a heavy perscription for correcting a lazy eye! I think way more people need to be aware that this sort of therapy exists and that it really does work! Lazy eye is not always just about muscle tone–for my daughter’s case, the vision was so bad in her one eye that her brain actually preferred to use the better eye and started to focus only our of her right (left was bad), so the eye drift was barely noticeable. The only reason my daughter’s ped caught is was by covering both of her eyes for a minute and then taking her hand off the ‘bad’ eye–this showed that her eye drifted slightly out, but this didn’t happen where she had both eyes open because she was focusing out of her right. The only way to get the brain to not shut off vision to the ‘bad’ eye was to patch her good eye and MAKE her brain use the bad eye with corrective lenses. We also did “pencil pushups” daily–we would take a pencil and draw a face on it or take a popsicle stick and draw a face on it and do eye pushups throughout the day. That was the vision therapy her ped. eye doctor recommended. So visual therapy alone may not be enough to correct a problem. Some ‘lazy’ eye problems are just muscle tone issues and some are related to severely poor vision. The only way to def. know is to find out what the vision is by having a pediatric ophthalmologist do a comprehensive vision screening. And it’s hard to really know if your child needs glasses because their vision is all they’ve really know, I think that’s why I cried the whole way home from her first appointment because I couldn’t believe that my daughter had seen this beautiful world so bad for 3 years. This is great information and motivation to include eye care in your baby’s health profile. Additionally, the American Optometrist Association and over 7,000 fantastic optometrists across the country have teamed up to provide FREE exams to babies age 6-12 months. You can search for a participation provider in your area at infantsee.org Thanks for a great post that highlights an important and underpublicized issue! Hi Elena, This is a very interesting article ! Could you please point me to the articles that help you understand how outdoor time can help in lowering the chances of myopia in kids ? Also what is the age when a baby/toddler should be taken to the pediatric ophthalmologist for the first time ? In my opinion around 6 months for the first time to make sure of the actual health of the eye (at that age all kids are farsighted so it’s not indicative of visual acuity yet), then at 1 years of age and then yearly because things can change so much. Adults are supposed to have yearly eye exams so I’m completely confused why they don’t have the same guideline for kids. Right after you posted about Lexi’s glasses on Instagram, my son’s teacher and therapist both mentioned in the same week that he seems to have trouble seeing close up. We never noticed, so I’m glad they did! It definitely seems strange that it’s not something commonly checked. Wow, it was fascinating to read this. I’m glad to hear your little cutie is seeing better now! I found it very interesting that outdoor time is protective for young eyes. (Especially since my husband needed glasses as a child, but I didn’t need them until ~ age 21.) I wonder if people in harsher climates like the north have higher rates of myopia since it may be more challenging to get outdoors during the winter months? Anyway, thanks for sharing!! You said that it is wrong to think that not wearing glasses helps your vision which I agree with. My ophthalmologist explained before that wearing glasses does make you very dependant upon them, so much so that your eyes can worsen overtime because one wears glasses and therefore the strength of the prescription is then increased over and over. Does this have any truth or was it unfounded? Definitely unfounded. This was believed to be true before there were studies to prove it wrong and then of course a lot of people and even doctors stick to it for lack of updated knowledge and correct facts. I’d find a new opthalmologist. In case of myopia (which is what I did the research on, I know very little about farsightedness), as we grow, our eye grows which is what makes myopia worse. So vision is bound to get worse up until the 20s when it stabilizes and then it can actually improve some time in the 30s. Also the only dependence that gets created by wearing glasses is that you expect to see clearly, rather than be used to not seeing. So it might seem like your vision is getting worse by wearing glasses, but in fact it’s simply your perception of your vision. There is some truth to this in people who are far sighted, but not in the way it seems. I am severely far sighted, but unlike a lot of people with near sightedness, I was able to contract the muscles in my eyes until I could see clearly. When my eye doctor first pointed out that I needed glasses, I thought he was crazy, and in the past 10 years my prescription has more than doubled before finally staying stable for the past 2 years. It’s not really because my vision has worsened, it’s because my eye muscles have finally learned to relax to the point that I can tolerate the proper correction. It took a long time to undo what was probably 20 years worth of overcorrecting on my part and by using glasses, I was finally able to let my eyes relax and relying on glasses to do the correction may have saved my vision (by not overworking muscles) rather than harmed it. Also, unrelated to the above comment, I would seriously challenge the notion that doing research at home is enough to state that physicians who draw different conclusions are wrong. Many times, doctors don’t value studies that seem to have significant findings due to confounding factors or conflicts of interest that may not be obvious to people doing their own research. I don’t believe in blindly following physicians (no pun intended), but making blanket statements that imply that because physicians draw different conclusions than someone doing their own research that they are wrong is a bit misleading. I think the bigger issue is physicians relying on outdated information which happens more often that it should. I think an ideal situation is to work with a physician while doing your own research to help understand the issue deeper. Research does not substitute advise of a medical professional because they have deeper knowledge if how the body works. I agree that parents should do research and listen to their doctors, which is why I made that comment. There were just a lot of references in this post to ways that doctors are constantly making outdated recommendations and I’m just not sure how true that is. I’m married to a physician who spends 8-10 hours a week voluntarily doing reading/researching and he’s not an anomaly by any means. I just think we should be careful when assuming we know why doctors make recommendations and whether our limited research can easily file them and their treatment recommendations into the poor or outdated categories. I second this, Katie. Most physicians keep themselves updated simply because they need to in order to do their jobs correctly. There are repercussions if a doctor’s practice is based on outdated information and data, not only for the patient but for the doctors themselves. My husband (also a physician) is constantly supplementing his knowledge with personal research. There are also a plethora of publications specifically designed to keep physicians updated that come out monthly and even weekly that he keeps on top of. Not only that, in Canada physicians are required to complete 75 hours of continued medical education per year, which includes attending courses and lectures on the latest practices and research. Obviously, as in any profession, some practitioners are more thorough than others. So it is important for a parent to keep an eye on things. It is also important to be able to trust (within reason, of course) the recommendations of a qualified physician. Funnily enough, my mother had myopia which improved drastically after she stopped wearing her glasses unless she was driving. She would also wear a contact in one eye to replicate the same effect as bifocals. Not sure if her vision improved by switching up her glasses/contact regime, or it just occurred due to her getting older. I’m not saying she personally noticed an improvement, I’m saying the optometrist changed her prescription to a new one which is very mild. Despite my dad never needing glasses and my mom only needing a mild prescription , my two sisters can’t see two feet in front of them and both my brothers need glasses too. I seem to have avoided the need for glasses but then again I haven’t had my eyes tested in years … Hmmm. Thank goodness for LASIK!!! Fascinating how genetics play out. It’s likely your moms vision improved due to her getting older as it often does after we get in our 30s. Now the contact creating bi-focal effect makes no sense, because if it’s only in one eye it’s not creating what bifocal does, it’s not reducing accommodation in the non-contact eye. Unless you need bifocals and have tried the one contact thing, or have an advanced degree in opthalmology or optometry that I don’t know about, maybe you shouldn’t be so quick to say that something makes “no sense”. It’s actually insulting. I wasn’t asking for or giving advice – just sharing something that worked for someone I know. It was advice that came straight from my mom’s optometrist who practices the one contact thing himself. It was actually a relatively commonplace practice before bifocal contacts were invented, which was recently considering my mom got glasses in the 80’s. Look into “mono vision” if you are curious. I just looked up wearing one contact in one eye and we are talking about completely different things. You were referring to someone who has nearsightedness AND farsightedness at the same time, hence needs both prescriptions (my mom has that and it’s a common thing when you get old). When I was talking about bifocals, I was referring to something completely different. When you wear glasses for nearsightedness, you have to strain your eyes to focus up close with your up close vision being perfect. Straining is not good for eyes or progression of myopia. So what helps that are bifocals where the lower part gets adjusted to your perfect close up vision and you don’t have to switch focus. It has actually been shown to help with progression of myopia because there is no strain like in single vision glasses. That’s why wearing one contact in one eye made no sense to me, because each one of your eyes are still accommodating. It only works for older people that actually need both prescriptions. Since my mom is myopic (she can see well at close range), she leaves one eye contact free and corrects for her myopia in the other – thus creating the same effect as mono vision. You don’t need to be both near and farsighted to take advantage of mono vision. Yes, ok, that makes sense too. But we are still talking about different things . I was referring to bifocals for reduction in accommodation as a method of slowing down myopia progression. In which case, the one contact wouldn’t work at all, since both eyes are still accommodating big time. Which it why it left me confused. It lets your mom see far and close up but it does nothing to slow down the progression (which is what our goal is). Though at her age, it’s very unlikely she is progressing anyways. You are welcome to keep this to yourself, but I think we all need a friendly reminder every once in a while that googling something and reading a few books about it doesn’t make one an expert. Ophthalmology requires upwards of 12 years of study while optometry requires 7-8. Both of which are complicated fields of study. No hard feelings, but you may alienate readers if you say they make “no sense” before you know their areas of expertise. I am a mommy and casual reader of mummy blogs and may be less inclined to swing by and check in after having it announced that some of my casual input made “no sense”. Whoa! Seriously! I actually really enjoyed your initial comment, so I am not exactly sure why you’re blowing it out of proportion. Saying that something doesn’t make sense to me doesn’t equal me saying “I know everything”, it means “I don’t know everything and therefore it makes no sense to me, help understand”. I think this is a great example of picking words apart. Especially since it turns out we were talking about completely different issues (which is why it made no sense to me). This is likely just another one of those times when undertone would make all the difference – it is just unfortunate that undertone can’t be conveyed via text. I’m sure if you had said “makes no sense to me” I wouldn’t have been offended, as that is a totally non-offensive statement. 🙂 Thing is, you said “makes no sense” and skipped the “to me” part. 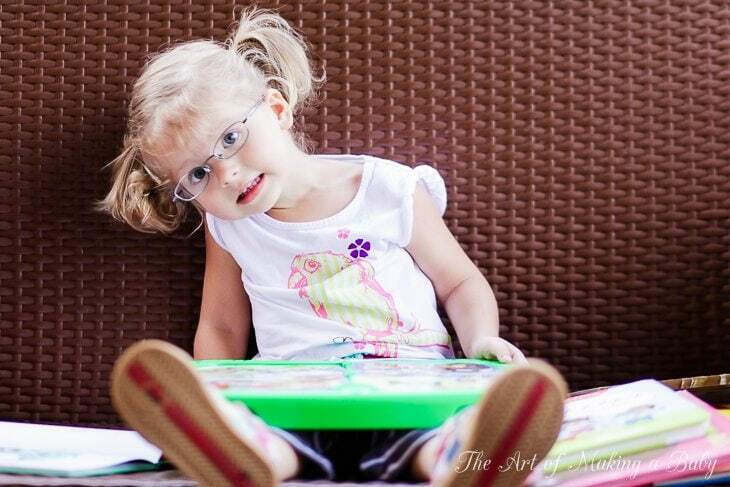 Lexi is so cute in her glasses! I remember getting my first pair of glasses (not till elementary school) and how amazing it was to be able to see individual blades of grass and leaves on trees. Thanks for this article- I had not taken my son to get his eyes tested because he does not seem to have any difficulty with vision. After reading what you said about Lexi not showing any symptoms of nearsightedness, I definitely will make him an appointment now. That is so interesting about the outdoor time as well. We do spend a lot of our time outdoors, so that is nice to hear! Yeah it’s definitely better to be safe than sorry. Now that I am reading about it, there are so many cases out there that parents didn’t know their kid had a problem until they were school aged and then it turns out one eye went so bad, it’s gone blind, because it wasn’t caught in time. I am not trying to scare anyone, of course, but I am just very shocked at the laissez faire attitudes doctors seem to be showing when it comes to vision issues and screenings. Also, it’s interesting to note that NOW that Lexi knows how well she COULD see, if she is without glasses, she starts squinting to see far away, or bringing things closer to her eyes to see something better, while before the glasses she didn’t do that, because she didn’t know she COULD see that well. If you’re normal sighted and then, you become near sighted, most of the time you don’t realize it. The first time I became near sighted, I believed that the others were far sighted, and I told them they needed glasses. Astigmatism and far sightedness are more noticeable. Great post! My husband and I both have terrible eye sight so we think it’ll just be a matter of time before our 1 year old needs glasses. 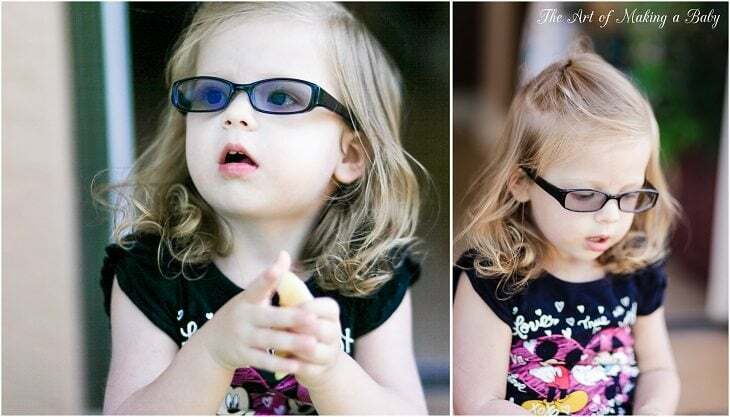 Do you have any advice in terms of durable/flexible/fasionable brands of glasses for little ones? I know Miraflex is very flexible and durable but personally I don’t like the styling at all. We picked the only two pairs of glasses that worked, in my opinion, at a local lens store the day of her eye appointment. We didn’t want to wait and were told we’d get them immediately. Now that I’ve had time to actually look around, I love the look of some of the Zenni Optical glasses and the Silhouettes. So we’ll be getting those in a few weeks. Also I heard that Babiators are looking to do prescription glasses which will be amazing since they are super flexible but also stylish. This post was SO informative to me. My husband and I both wear glass and I didn’t start wearing them until my teens when I was straining my eyes WAY too much reading. Once our son turns two we are headed to the eye doctor no matter what. Regarding the one contact thing- my dad got LASIK back in the 1990s when it was a fairly new practice. They did the one eye thing on him- they made one eye good for close up work, and the other eye good for distance. It was weird, but he was legally blind prior to that, so it was a huge improvement for him. Unfortunately, his astigmatism grew back, so he now wears glasses again. But he is not legally blind anymore, so he still feels like the surgery is worth it. I think that LASIK has vastly improved since then. Very interesting about the sun having such impact. I know that the best way for the body to absorb vitamin D is through the eyes. I would suggest the miraflex for a 1 year old. they have many styles. my son wears a different brand that I’m not too thrilled with but it was the only one the store carried. the store that was geared for kids told us to keep him quiet so we walked out. my son got glasses at 2 but had seen an opthomologist at 16 months already. She looks so alert and happy in those pictures. Seriously, its like a different child. So glad you guys finally got this figured out. Sorry the doctor seemed to downplay Lexi needing glasses, but it is so common, and he was probably trying to calm you guys down. Some doctors are less people-persons than others. And hey, glasses are hip these days, so don’t even worry about it. Yeah the glasses didn’t help with the alertness. Lol like we didn’t have enough of that, as it is 🙂 but I’m just happy she can see well. You should see her at the gym now. I’m not sure I it’s the age or the glasses but she is even more hyper there. Cataracts run in my family (a few of my cousins had to have surgery as children) so I wanted my 2 year old checked. I called to make an appointment and they told me he was too young. What? See, that’s what I am talking about. It is ridiculous how vision isn’t considered something worth checking early on. Dental health is similar, it’s hard to find a dentist who wants to see a child before they are two. It’s like just because they can’t clear tell you that they have a problem with their vision, the problem doesn’t exist. So frustrating. Definitely call around. Search for a pediatric ophthalmologist specifically, since they deal with kids. We all want that perfect child; first to walk, talk, best hair, funny, healthy, etc. but every child is different. 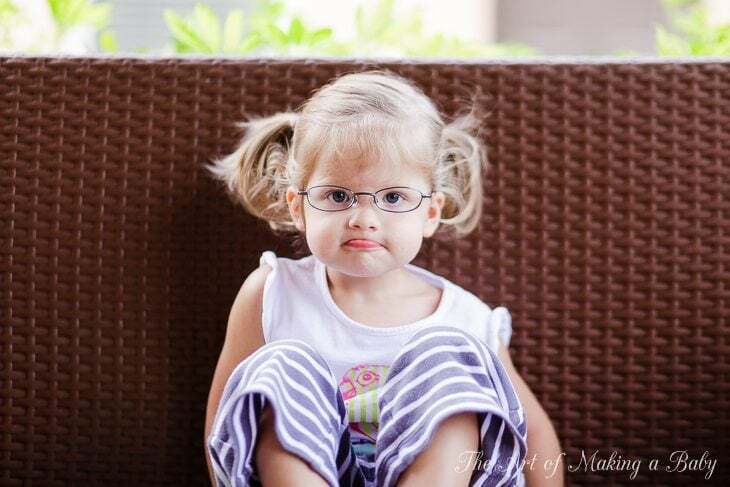 Glasses don’t make her better or worse or “less pretty” than other children (even though society wants to let us think that some times). There are at worse things that some parents are dealing with. Trust me. I work with some of the most amazing resilient children. Bravo for you for following through with the eye check up. And cut your hubby some slack. ??? ?It almost sounds like you are blaming him for this. It’s just the genetics lottery. She IS perfect and she IS healthy. Glasses don’t change that for a second. She is so precious in those glasses! I started wearing glasses when I was 7 after my father noticed in softball that when I’d hit the ball I’d whack it clear across the field, but I rarely managed to connect bat to ball. After getting my eyes checked out, they were already so bad that the doctor was impressed I’d made it so far in school without having any issues! On the super-plus side, I went from a semi-decent softball player to a stellar player throughout the rest of my child/teenhood. Agree with you that parents should start looking at eye health as seriously as the rest of the body, especially when kids are too young to understand they can’t see clearly! Your daughter looks great with her glasses. 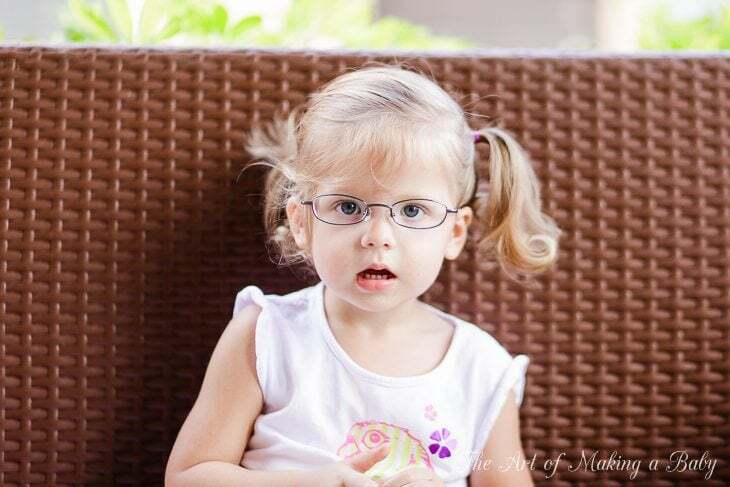 I started wearing glasses at 8 and my husband at 7, so we were a little surprised when my middle child (my only daughter) needed glasses at 4 years, 11 months. Because one of my facebook friends posted about her son being on his 3rd pair of glasses, we started looking for a durable option. 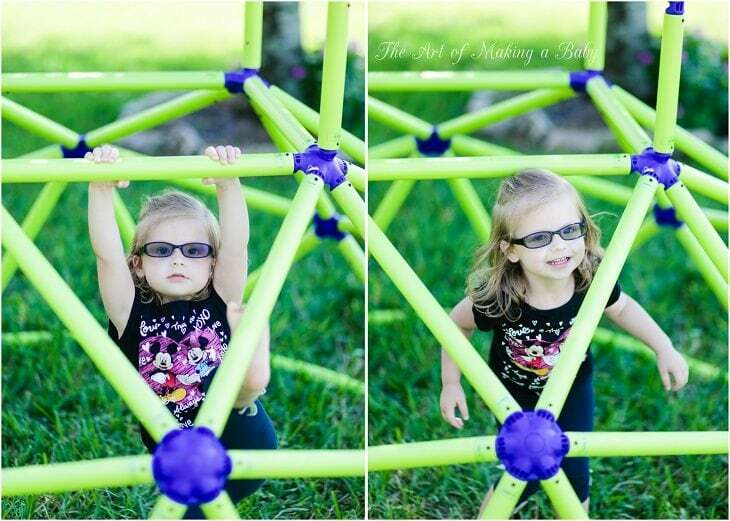 A friend, who is actually a pediatric opthamoloigst in Miami (we’re in NY) suggested miraflex silicone frames. We put the transitions coating on them and with insurance it was around $78. They have a strap in the back and are very flexible. We haven’t had a problem. I always keep a glasses case in her school backpack, so if she gets tired she can take them off. My 2 year old has glasses too and it was so hard to find ones that fit her. Where did you find hers? Did you get ones with cable temples? I think we went to a place called Vision Works, and these were the smallest. I think the best thing to do is order online once you know the sizing. Great info, yes thank you so much for sharing……I wish I had more info when my oldest was younger. She is myopic as well. We didn’t get a prescription for her until 2nd grade. Her vision has worsened over the course of a year and the Opth. believes it is because she spends more time on the computer now that she is entering 6th grade. We try to limit her exposure to computer and all similar devices at home (as much as possible in this day and age)….she doesn’t play video games except on the rare occasion and tv is limited to one quick show per day. I was surprised how computers and similar devices can have such an affect on vision. I know this is a really old post but I just wants to let you know about a program called InfantSEE. Optomotrists that are part of this program offer free eye exams to babies 6-12 months. We took my son in just before 3 months old because we could tell he couldn’t see well (wasn’t tracking objects, reaching for toys or having good eye contact) sure enough he is severely farsighted and got his glasses 2 days before he was 3 months old. The difference in his personality and ability to see was like night and day! His glasses are from Solo Bambini- they are very durable and made of one solid piece of plastic and held on with an elastic in the back. Good job for following up and getting the glasses- I definitely know what you mean when you said how happy you were to see the positive change in her with better Vision. It’s amazing! So, this does means that, at the age of 3 months, eyes are already formed and can see normally? I can tell that a the age of 1 children can already see normally (from my early memories), but i didn’t know that at the age of 3 months eyes were already ready to get tested. PS- Myopia can also improve. One of my former classmates during high school, told me that he started to wear glasses due to myopia at the age of six, and he had thick lenses. At the age of 18, he had only -0,75 dioptres. All babies are farsighted when born but it slowly improves until about age 5. My son was more than double the normal amount of farsightedness for his age.